Picking up your badge: Please follow the Signage towards the Registration Office (Bay A &B) upon your arrival at the hotel and grab your badge from Ticketpro desk starting at Friday, Feb 1, 10am until 8pm each day (except Monday). Toronto Blues Society Charter Members (and equivalents) in good standing receive discount registration to Blues Summit 9. To access special member pricing, join TBS today. 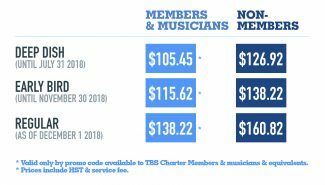 Musicians may also take advantage of the TBS Member discount. To retrieve the required promo code to unlock the rates below, please contact the TBS office. All passes and wristbands will be available to pick-up at the Registration Office at the Hotel, Marriott Courtyard Downtown Toronto between 10am-8pm during the Blues Summit. 3-Night-Packages of “Showcase Only” Tickets Are Now Available to Members! Tickets are for 3 nights covering all the showcases taking place between February 1-3 ($40+service fee) and single night tickets are NOT available. Ticket buyers will be given a wristband when they check in at the registration desk at the hotel, which will be valid ONLY for the showcases starting at 8pm during 3 nights and won’t cover the other activities happening during the Blues Summit. A limit of maximum 4 tickets per person will be applied. TBS Charter members can contact the office at info@torontobluessociety.com or 416 538 3885 for their promo code. Please note that the tickets are standing only and seating will be very limited. Delegate passes for Blues Summit 9 do NOT include tickets to the 22nd Annual Maple Blues Awards, which will be held February 4, 2019 at Koerner Hall. Tickets for this event must be purchased directly from the Royal Conservatory of Music’s Koerner Hall Box Office. Exclusive pre-sale for TBS Charter Members is on now! Tickets go public on Friday, June 22nd. Delegate List: Before Friday, review the delegate list on the TBS website. Go through the list to identify key contacts. It is important to know who is coming and who you would like to meet. Research key delegates beforehand so you know who they are and what they do before you meet them. The delegate list is updated frequently so be sure to check back. CDs: It is beneficial to have something to give to radio hosts, festival directors, etc that showcases your musical sound. This can be a CD, demo disc, flash drive, whatever you’ve got. Artists are encouraged to distribute their CDs to key delegates using the conference’s Drop Box system. Drop Boxes: Media reps, festival directors and other VIPs can request personalized drop boxes (literally a cardboard box) with their name/info on it for artists to place CDs into. There will be a dedicated Drop Box area. Business Cards: Make sure you come prepared with your promotional package and business cards. Whenever you hand off promo materials or a CD, ask for a business card. In fact, ask for a card even in casual conversations. Write notes about the person on the back of his or her card (or in a notebook) so you can follow up after the conference. This is about building relationships and community, so following up after the conference is very important. Showcases: Take time to check out the showcases and connect with other musicians. Many artists there will have a wealth of experience, tips, ideas and recommendations to share about the conference and the community. Blues Summit is a great opportunity to bond with other musicians and build relationships for future planning and (of course) future music making. Food: The music conference experience can be invaluable, but it can also be expensive. If you will be sleeping at the hotel during the conference, it’s a great idea to hit a local grocery store to stock up on some healthy snacks and drinks beforehand to keep on your person or in your hotel room. Seminars/Panels/Workshops: Attend as many sessions and seminars as you can. The conference offers a broad range of discussion topics. The hotel restaurant is a great place for relaxed networking.